“For over three decades since its founding, The Galactic Asteroids Patrol has been blowing up asteroids in every asteroids-infested corner of the Galaxy. Once a new and proud initiative, the Patrol has now reduced to a small desolate and underfunded department in a forgotten corner of the vast galactic bureaucracy. Of its once young and daring pilots those who survived count their remaining years to retirement on a small government pension. Its spaceships, decades ago considered the pinnacle of spaceship design and technology, are almost space junk to modern eyes – barely kept in service through repeated retrofitting and cheap part replacements. 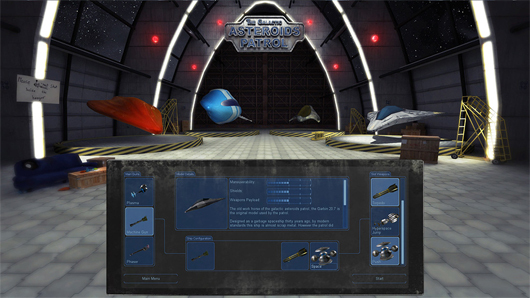 In the years since the publishing of this piece The Galactic Asteroids Patrol has been greenlit on Steam but that hasn’t seemed to eventuate. The studio’s websites and social media pages have also vanished. This is unfortunate as this was a very promising little title but I wish the former crew of Invigo Studios, Amir and Noam, all the best with whatever the future’s entailed. Back when I was the tender age of seven or so, I was helping an old friend’s family get ready to move to a different house close by. Whilst packing things into boxes we came across what looked like a big vertical TV with some kind of controller attached to it and asked his mum what it was. She told us how herself and her husband had bought it when they were teenagers and that it was a videogame system. It turned out to be an awesome Vectrex. We turned it on and the screen booted-up to show a small triangle which you could manoeuvre to shoot and avoid large rock-looking things that whizzed around the screen. This would be my first experience playing the classic Asteroids. The Vectrex I played as a child sadly died a few years ago. Those memories of shooting hulking space rocks into oblivion have however have stayed with me all these years, which is why I’ve been super pumped to talk with you all about this modern take on the formula I’ll be looking at today. 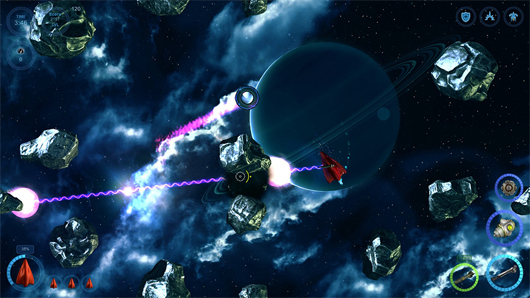 The Galactic Asteroids Patrol is a new retro-inspired space shooter from indie developer Invigo Studios, a fledgling company founded in 2012. The Galactic Asteroids Patrol is the first game from this company and they’ve chosen to follow the old tradition of “blowing things up in outer space” for their debut whilst throwing in more modern mechanics and visuals. The first thing I thought of right from the get-go during my initial play of the game, was how the game could be described as ‘Asteroids on Steroids’…or even aSTEROIDS. The malleability of the Unity engine has let the developers incorporate some pretty nice looking models and animation into the game, especially for the ships and weapons. Talking about the ships, there are four in total to select from (three unlockable and one from the start) which you can pimp out with weapons and abilities you unlock during the game and, like Rubicon (which I recently took a look at HERE) it’s reminiscent of the old Mechwarrior games. Each ship has its own strengths and weaknesses and in total there’s around 100 different combinations possible. You won’t just be pew-pewing your regular run-of-the-mill pieces of celestial rock either, with variations such as molten and magnetic asteroids as well as some which are booby-trapped with explosives. Each asteroid has its own advanced physics simulation to keep things feeling that little bit more realistic (as realistic and flying around shooting things in space can be anyway. Look to the future folks!). UFO’s will also fly around the screen every now and then and, even though they’re harder to take down, they’ll lead to mega-points when destroyed. Points are also the ‘point’ of the game if you will, as getting the most amount of points during the time limit will lead to you unlocking bonuses for your ships and even receiving more currency to spend on upgrades. You can also earn more points by pulling off all kinds of specialty shots. Shoot an asteroid across the other side of the screen? You just earned yourself a ‘Longshot’ son! These kinds of bonuses become easier as you start unlocking more ships and weapons via meeting certain achievements (eg. ‘Survive Level 2 Undamaged’, ‘Destroy 5 Alien Ships etc.). This is a great inclusion since keeping track of every piece of asteroid as they break up from being hit can be tough at times. One of the unlockable weapons that will make your spaceship-piloting life much easier happens to be the Phaser, which can shoot a blast of energy all the way across the screen thus making double and even triple asteroid kills that much easier. The beta of the game I played for this article was lacking the planned multiplayer component, but that’ll be thrown in by the time the game’s released. Team up with friends in co-op play or face off against them in a kind of awesome sci-fi dogfight death match. Having to not only take on the giant asteroids, but also someone trying to shoot you down will add a whole lot of challenge and fun to the game and I’m looking forward to this feature. In conclusion, if you want a bit of old and a bit of new mixed with your Asteroids experience, a little bit of country mixed with a little bit of Rock ‘n Roll then The Galactic Asteroid Patrol will certainly wet your gaming whistle). Retrospekt will of course keep you updated on the game’s release and any other news regarding it which comes our way.